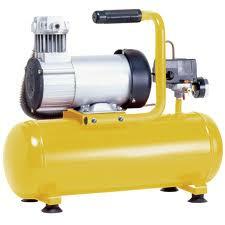 An air compressor is a device that converts power into kinetic energy by compressing and pressurizing air, which, on command, can be released in quick bursts. There are numerous methods of air compression, divided into either positive-displacement or negative-displacement types.Positive-displacement air compressors work by forcing air into a chamber whose volume is reduced to compress the air. Piston-type air compressors use this principle by pumping air into an air chamber through the use of the constant motion of pistons. 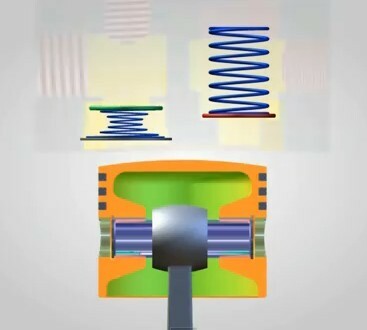 They use one-way valves to guide air into a chamber, where the air is compressed. Rotary screw compressors also use positive-displacement compression by matching two helical screws that, when turned, guide air into a chamber, whose volume is reduced as the screws turn. Vane compressors use a slotted rotor with varied blade placement to guide air into a chamber and compress the volume. 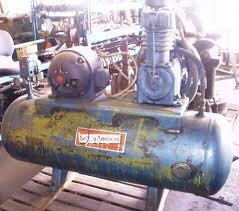 Negative-displacement air compressors include centrifugal compressors. These use centrifugal force generated by a spinning impeller to accelerate and then decelerate captured air, which pressurizes it.